Description: A daughter of K F Evergreen Erica 4402 and was the featured donor for our inaugural online heifer sale in 2014 featuring her daughters by Connealy Capitalist and EXAR Upshot. Her Upshot daughter produced a top selling Kramers Apollo daughter in our 2016 online heifer sale going to Troy Kwasniewski in South Dakota. Her Musgrave Foundation daughter produced a Kramers Apollo bull in 2016. Her 2016 bull by Mohnen South Dakota sold in our bull sale and her 2016 bull by Musgrave Black Loch is serving as a herdsire in our herd. 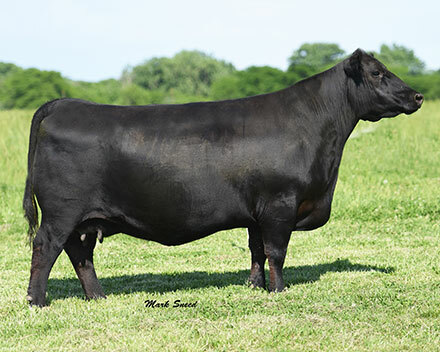 Her 2017 embryo bull by Mohnen South Dakota sold in our 2018 bull sale and her 2018 embryo bull by SAV Sensation will sell in our 2019 bull sale. Description: DECEASED. She was acquired from the Lynnbrook Farms performance herd in Williamsfield, IL and is a prolific embryo producer with flushes of 42, 46, 17, 9 and 24 high quality embryos by MCATL Pure Product, MCATL By Product, Koupal Advance, S A V Resource and Mohnen South Dakota. Her natural daughters by S A V Final Answer and Connealy Consensus 7229 were Lamoine Valley Parade of Champions top sellers and Lamoine Valley Field Day show champions for Troy Rawlings of New Holland, IL. She has sons by MCATL Pure Product, Mohnen South Dakota and SAV Resource working in local purebred and commercial herds. Her 2015 daughter of Mohnen South Dakota topped our 2015 online heifer sale at $10,500 going to Bill Hargraffen at Muscatine, IA. Her 2017 granddaughter by KR Millionaire topped our 2017 online heifer sale. Her MCATL By-Product daughter sold for $9,500 in the 2015 Musgrave Angus production sale. Her 2017 daughter by SAV Resource will sell with a calf at side in our 2019 production sale. 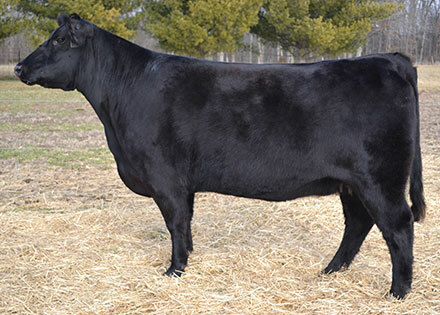 Description: A daughter of LBF Blackcap Lass 905 and the top seller in our 2015 online heifer sale at $10,500 to Bill Hargraffen in Muscatine, IA. 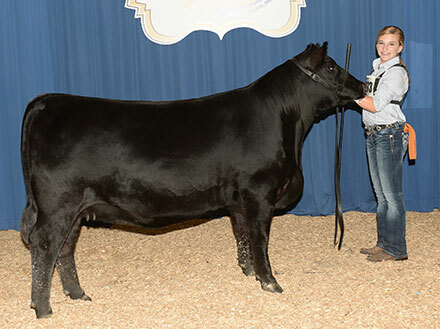 Pictured here with Emily Kiesewetter competing at the 2016 National Junior Angus Show in Grand Island, Nebraska. We didn’t win any trophies, she is too cowy looking to compete at a big show, that’s the way we like ‘em! She was a Land of Lincoln class winner at the 2016 IL State Fair open show. Her first calf in 2017 by KR Millionaire topped our online sale at $6,750 so she is off to a great start! We are very excited about her future to produce beefy and easy fleshing performance cattle.